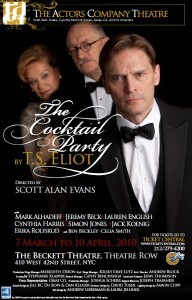 You’re invited to the brilliant, witty world of “The Cocktail Party” – T.S. Eliot’s profound exploration of self-deception and redemption. Edward and Lavinia Chamberlayne are throwing a party at their fashionable London flat. The guests arrive only to discover that their hostess is no where to be found and a rather strange man, who no one knows, seems right at home. Ruthless and compassionate, this “Cocktail Party” embodies the day-to-day struggle of domestic life while turning the classic ‘drawing room comedy’ on its head.